A company should not re-roof too soon and waste finances, but they do not want to wait too long either and constantly be paying for roof repairs. Deciding whether to do roof repair or replacement is not an exercise in timing or guessing, it is based on gathering adequate accurate information. Eventually, all flat roofs wear out whether in Toronto or Toledo and need to be replaced. However, if you replace a commercial flat roof before it is needed you will be wasting finances that could be used elsewhere. Alternatively, if you wait too long and rely on repairs on an ongoing basis you could end up with leaks resulting in expensive property damage. You need to know how to assess the overall condition of your roof and identify early signs of roof failure. Determining which – repair or replacement – is right for your industrial or commercial flat roof requires proper assessment of the overall condition of your flat roof to identify and prevent damage due to moisture. Our method of inspecting your roof with thermal infrared scanning technology allows us to locate the source a leak right to its origin. We use infrared technology and years of experience in the flat roofing industry to detect any moisture issues on your commercial flat roof. You would be provided with documentation and thermal imaging pictures that show precise areas of your roof that need repair or perhaps areas that need to be replaced. If the damage is extensive then we will recommend a flat roof replacement. Be aware that many roofing contractors will lean towards a complete flat roof replacement when that may not be the best option for you. At Roof Scan.ca we consider many factors when determining whether a roof repair or flat roof replacement is needed. 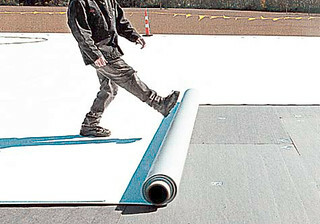 You must consider the life expectancy of your commercial flat roof, the size and location of moisture damaged areas. We will also discuss with you your company’s financial needs and allocations. In some cases ongoing commercial roof repair will be a better option even though the roof could require a replacement due to funding. In cases like that our staff will perform ongoing flat roof maintenance or ongoing repair targeting the extremely damaged areas first. In other cases a complete roof replacement is required due to safety and possible extensive equipment damage. Your roof is an important investment. It literally covers all of your company investments! Preventative commercial flat roof maintenance is key. There are many obvious signs of moisture damage including mold, dark areas on the ceiling, peeling paint, damp spots, and water stains. The damage tyes vary from city to city because the weather in Toronto or Mississauga is not the same as the weather in Edmonton. But why wait until the damage has been done? Allow us to bring our technology and experience to your flat roof to determine if industrial roof repair or replacement is right for you. Maintaining a yearly scheduled repair or roof analysis to determine if a roof repair is needed will prolong the life of your roof. Start by marking that on your calendar and contact Roof Scan.ca today.